If you are in the mood for some backcountry 4x4 camping, you are a special kind of person. Not just anyone can make it in the backcountry. If your idea of camping includes a decked out RV complete with satellite television, this article may leave you shaking your head in amazement. However, if you are looking for a true adventure, heading into the backcountry in your 4x4 offers the ultimate camping adventure. There are a few things that you need to remember when you plan your 4x4 camping trip. The most important thing to remember is water - and lots of it. When you are in the backcountry there are few, if any, places to get safe, clean drinking water. It is a good idea to carry bottled water or at least carry a water purifier for camping so your water is safe. Another consideration is the weather. Things can change very quickly, especially if you are in the mountains. What started out as a beautiful, sunny day can suddenly become cold, rainy and miserable. Always bring adequate clothing for any weather situation that you may encounter and pay close attention to the forecast on the radio or television. Be sure that your tent is waterproof. There is nothing that will ruin your camping trip faster that waking up soaked in the middle of the night. Also, keep in mind that not all parks allow you to collect firewood. It is a good idea to have a backpacking stove for areas that will not allow campfires. Make sure you understand the rules and regulations of a park before your camping trip and you will avoid fines and other situations that will spoil your trip. Lastly, be considerate. Clean up after yourself so others can enjoy the outdoors, too. Consider the wildlife as well. Many parks will not allow camping near sources of water and feeding wildlife is always prohibited - for their safety as well as your own. Now, take a look at a few places where you can enjoy a terrific backcountry 4x4 camping trip. You may be able to begin your backcountry adventure in an area near where you live. National forests and wilderness areas often welcome campers. However, for the backcountry excursion that offers more than just your every day hike, consider heading to California, Colorado, and Utah. Each of these states has something unique to offer to both the novice and the experienced camper. Pack up your 4x4, and get ready for the adventure of a lifetime! If you are a 4x4 fan, when you think of California you probably think of Death Valley. Because of its incredible beauty and value scientifically, Death Valley was proclaimed a national monument in 1933. By 1994 Death Valley was expanded to 1,200,000 acres and declared a national park. Today, the park has over 3,000,000 miles of wilderness for the backcountry enthusiast to enjoy. The incredible geology, ghost towns and other points of interest makes this park a favorite destination for hikers, campers and outdoor devotees of all kinds. A visit to Death Valley National Park will be one that you will not soon forget. Camping is only allowed if you go two miles beyond any developed areas, paved roads or day use only areas. You can obtain a voluntary, free permit for camping and you are asked to use pre-existing campsites. Also, be sure to park your vehicle along the road to protect the natural areas. Colorado is a beautiful place to camp and it is difficult to pick the best place to go if your interest is four-wheeling. One great place to visit is Great Sand Dunes National Park. There are numerous activities available including horseback riding, hiking, bird watching and, of course, 4x4 trails. Medano Pass Primitive Road is a great trail located about 11 miles from the Visitor Center. Try to plan your trip in the fall so you can experience the incredible beauty of the changing Aspen trees. The colors will take your breath away. Camping is available on a first come first served basis and is allowed only in designated areas. If you plan on doing any backpacking while you are there, a free backpacking permit is available at the Visitor Center. Park admission is only $3 for adults and children are free. Regular campsites are $14 per night. These districts are from two to six miles apart so only one per trip would be reasonable. The most accessible, and best trail for beginners, is the Island in the Sky. The Needles is a bit more rustic and backcountry while the Maze is the most remote. You will need a 4x4 permit which costs $30. Each district varies in what is permitted as far as group size and number of vehicles allowed, so it is a good idea to check out the Canyonlands permits page before making your plans. Reservations are not required for camping but they are highly recommended since campsites fill up fast. More information on reservations can be found at the National Park Service website. Of course, California, Colorado, and Utah aren't the only backcountry destinations in the country. In fact, you may want to find some 4x4-friendly places closer to home. It's not always wise to head into unknown country, however, since it might just be private property and off-limits to vehicles. The following tips will help you find the perfect destination for your next backcountry excursion. 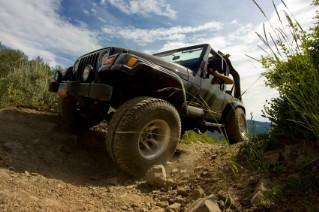 4x4 forums: If you really want to know where to go, then visit sites like RME4x4. This site features destination tips and advice from backcountry enthusiasts just like you. Seek recommendations: Talk to other backcountry campers. Sometimes word of mouth is your best resource, but you can also post what info you are searching for on social networking sites like Facebook. Bureau of Land Management: Head to the Bureau of Land Management website and click on the region in which you live or in which you want to visit. You'll find lots of valuable information, including contact info. National Park Service: The NPS website is filled with information for a wide variety of camping opportunities. Check out relevant material that is specific to your state or region. Anytime you plan to visit the backcountry, it is a good idea to let someone know where you will be. It is always best to take every safety precaution so that your camping trip is fun and worry free. Also, read the rules for each park thoroughly so you can plan accordingly. While there are many other places that you can visit, these are some of the best. Enjoy your backcountry 4x4 camping vacation.